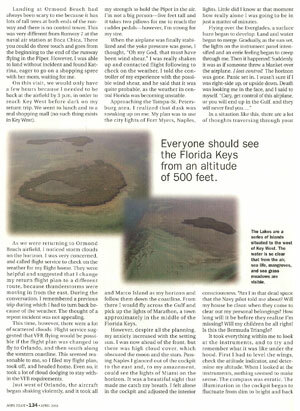 Originally published in AOPA Pilot Magazine, in their April 2003 issue, as "Surviving Get-Home-Itis"
It started out to be a great day in Key West. I called the Miami center and checked on the weather for a flight to Ormond Beach Municipal Airport. I was living in Key West, and wanted to fly up and spend the day with my daughter in Daytona. The Miami Weather center reported that I should have a clear flight for a VFR flight plan. The weather was beautiful, and I already had the Piper Warrior reserved. As manager of the Flying Club at the Boca Chica Naval Air Station, I frequently flew that particular aircraft. The club also owned a Cessna 152, but I preferred the low wing configuration. I went to the Naval Air Station, filed my flight plan, did the preflight inspection and headed to Ormond Beach. As a matter of policy, I requested flight following. I had flown this route several times since my daughter, Katrina, had moved up there. 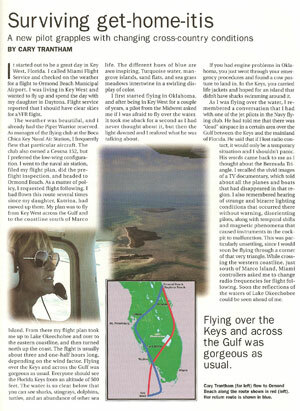 My plan was to fly from Key West across the Gulf and to the coast line south of Marco Island. From there my flight plan took me up to Lake Okeechobee and over to the Eastern Coast Line and then turned north up the coast. The flight is usually about three and one-half hours long, depending on the wind factor. Flying over the keys and across the Gulf was gorgeous as usual. Everyone should see the Florida Keys from an altitude of five hundred feet. The water is so clear below that you can see sharks, stingrays, dolphin, turtles, and an abundance of other sea life. The different hues of blue are awe inspiring. Turquoise water, mangrove islands, sand flats and sea grass meadows intertwine in a swirling display of color. Mangrove islands in the Florida Keys. I first started flying in Oklahoma, and after being in Key West for a couple years, a pilot from the Midwest asked me if I was afraid to fly over the water. It took me back for a second as I had never thought about it, but then the light dawned and I realized what he was talking about. If you had engine problems in Oklahoma, you just went through your emergency procedures and found a cow pasture to land in. In the Keys, you carried life jackets and hoped for an island that didnÕt have sharks swimming around it. As I was flying over the water, I remembered a conversation that I had with one of the jet pilots in the Navy Flying Club. He had told me that there was a "dead" air space in a certain area over the Gulf between the Keys and the main land of Florida. He said that if I lost radio contact, it would only be a temporary situation, and that I shouldnÕt panic. His words came back to me as I thought about the Bermuda Triangle. Chills ran up and down my spine as I recalled the vivid images of a TV documentary, which told about all the planes and boats that had disappeared in that region. I also remembered hearing of strange and bizarre lighting conditions that occurred there without warning, disorienting pilots, along with temporal shifts and magnetic phenomena that caused instruments in the cockpit to malfunction. This was particularly unsettling, since I would soon be flying through a corner of that very triangle. While crossing the western coast line, just south of Marco Island, Miami controllers asked me to change radio frequencies for flight following. Soon the reflections of the waters of Lake Okeechobee could be seen ahead of me. Landing at Ormond Beach was always scary to me because it had lots of tall trees at both ends of the runway and there was no control tower. This was very different from runway 7 at the Naval Air Station at Boca Chica. 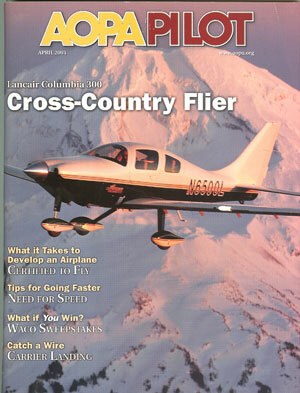 There you could do three touch and goes from the beginning to the end of the runway flying in the Piper. However I was able to land without incident and found Katrina waiting for me eager to go on a shopping spree with her mom. On this visit, we would only have a few hours because I needed to be back at the airfield by 3:00PM in order to reach Key West before dark on my return trip. We went to lunch and to a real shopping mall (no such thing exists in Key West). As we were returning to Ormond Beach airfield, I noticed storm clouds on the horizon. I was very concerned, and called flight service to check on the weather for my flight home. They were helpful and suggested that I change my return flight plan to a different route, because thunderstorms were moving in from the west. During the conversation, I remembered a previous trip during which I had to turn back because of the weather. The thought of a recurring incident was not appealing. This time, however, there were a lot of scattered clouds. Flight service suggested VFR flying would be possible if the flight plan was changed to fly to Orlando, and then south along the western coastline. This seemed reasonable to me, so I filed my flight plan, took off and headed home. Even so, it took a lot of cloud dodging to stay within the VFR requirements. Just west of Orlando, the aircraft began shaking violently, and it took all my strength to hold the Piper in the air. I'm not a big person-five feet and one hundred and fifteen pounds and it takes two pillows for me to reach the rudder pedals-however, IÕm strong for my size. When the airplane was finally stabilized and the yoke pressure was gone, I thought, "Oh my god, that must have been a wind shear." I was really shook up and contacted flight following to check on the weather. I told the controller of my experience with the possible wind shear, and he said that it was quite probable, as the weather in central Florida was becoming unstable. Approaching the Tampa - St. Petersburg area, I realized that dusk was sneaking up on me. My plan was to use the city lights of Fort Myers, Naples, and Marco Island as my horizon and follow them down the coast line. From there I would fly across the Gulf and pick up the lights of Marathon, a town approximately in the middle of the Florida Keys. However, despite all the planning, my anxiety increased with the setting sun. I was now ahead of the front, but there was high cloud cover, which obscured the moon and the stars. Passing Naples I glanced out of the cockpit to the east and, to my amazement, could see the lights of Miami on the horizon. It was a beautiful site that made me catch my breath. I felt alone in the cockpit and adjusted the interior lights. Little did I know at that moment how really alone I was going to be in just a matter of minutes. Flying over the everglades, a surface haze began to develop. Land and water began to merge. Gradually, as the sun set, the lights on the instrument panel intensified and an eerie feeling began to creep through me. Then it happened! Suddenly, it was as if someone threw a blanket over the airplane. I LOST CONTROL! The horizon was gone. Panic set in. I wasnÕt sure if I was right side up, or upside down. Death was looking me in the face, and I said to myself, "Cary, get control of this airplane, or you will end up in the Gulf, and they will never find youÉ"
In a situation like this, there are a lot of thoughts traversing through your consciousness. "Am I in that dead space that the Navy pilot told me about? Will my house be clean when they come to clear out my personal belongings? How long will it be before they realize I'm missing? Will my children be all right? Is this the Bermuda Triangle?" It took everything within me to look at the instruments, and to try and remember what it was like under the hood. First I had to level the wings, check the attitude indicator and determine my altitude. When I looked at the instruments, nothing seemed to make sense. The compass was erratic. The illumination in the cockpit began to fluctuate from dim to bright and back again. The attitude indicator began to roll and there was a high pitched buzzing in my headset. I finally got the airplane level and glanced at the altimeter, but I had no idea what the altitude was. Perhaps, subconsciously, I didn't want to remember. It is amazing how many hours are in a few minutes. I was trying to concentrate on the instruments and not look outside. Before the blanket had been dropped over my airplane, flight following had asked me to change frequencies, but I hadnÕt made contact yet. The new frequency was keypunched in but I wasn't sure where I was in relation to the town of Marathon. I didn't know whether I had drifted east or west. I tried to keep my wings level, but I was so shaky, that I was over controlling the airplane. I couldn't tell if I was over land or water. It was totally black outside the cockpit Ð no city lights, no horizon, nothing! I tried making contact on the new frequency, but Miami wasn't responding. (That dead radio air space). Again that panic feeling. I looked at my notes to find the earlier code frequency. I found it, punched it in, and radioed the controller. The air controller's voice sounded cold and indifferent. He said that he had just turned me over to another frequency, and couldn't talk to me. My response was: "Yes, but I am up here all by myself, and I don't know where I am." He suggested that I "Climb to a higher altitude". This should have put me over the edge. I was in a total state of shock, trying to fly an airplane that seemed to have a mind of its own and nobody would talk to me. By this time I was in another level of consciousness. My mind was aware of only one thing, and that was survival. I was in control of the airplane but not in control. At least I wasn't in a dive Ð I was still in the air. Nervously, I climbed higher and changed frequencies to the one he had given me. Still no response, so I climbed even higher to about 4000 feet. Finally, I heard a woman controller respond. I asked her to please give me my location and a heading for Marathon. She did, and about twenty minutes later, I saw lights on the horizon. "Is that Marathon?" Yes, she responded. All during this time, I had been desperately flying the airplane on instruments. Once I arrived at the Seven Mile Bridge, which separates the island that Marathon is on from the rest of the chain of islands, I could follow the lights of Highway One. I started looking for familiar landmarks, trying to recognize Big Pine Key. At that point I would be within radio range of the naval air station control tower. I was about 22 miles from Key West, when I contacted the Naval Air Station, which is approach for anyone flying into the naval air station or Key West International. I was so happy to hear the Navy controller's voice. He gave me a transponder code and my location, and then told me to contact the tower when I had the airport in site. When I landed the little Piper and taxied to the ramp for the Flying Club, I was at the point of exhaustion. I literally had to pry my hands from the yoke. I noticed how low on fuel I was and had another panic feeling. I tied down the airplane and went in to fill out the paper work. Again, I realized how lucky I was, and how close I came to the "dead man's spiral" and being another lost airplane in the Bermuda Triangle. I donÕt question why I survived. For whatever reason, it was a miracle, as all odds were against me, I just give thanks. The next day, I talked to the President of the Club, a commander in the Navy. He gave me a long lecture about putting myself in IFR conditions. It was a tough lesson, and one that I feel that I am very lucky to have survived. Even though I followed all of the rules about checking weather I should have landed at Tampa or Naples without trying to get home. Flying over water at night has its own treacheries. Boat lights can look like stars or another airplane; there is no horizon because the sky and the water blend together. There is no such thing as flying VFR over water at night. You must use and trust your instruments. Two days later, still in a state of shock, I called to see if the airplane was available and went flying again. It was like getting back on the horse after he throws you off. I had to do it! While fueling up the Piper at the FBO I shared my experience with another pilot and told him how scared I was. He said, "Cary, you're a private pilot and that's a lot to be proud of." Reflecting on his words, I realized he was right.